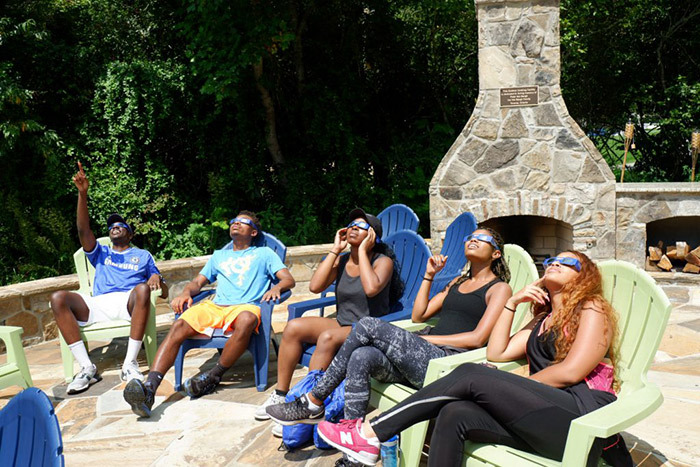 New students in Goizueta Business School's BBA Program enjoyed an extra activity during their orientation last week: The conference center in Clayton, Georgia, where they were staying was in the path of totality for the solar eclipse. 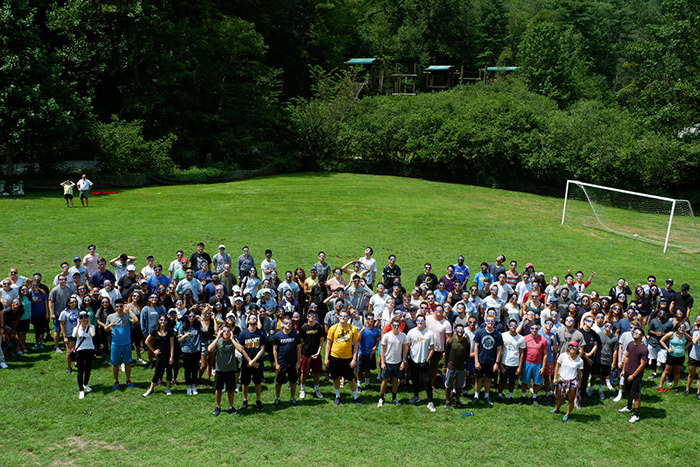 Each year, students in the bachelor of business administration (BBA) program at Emory's Goizueta Business School experience the high-ropes challenge courses and unique Alpine Tower at the Kaplan Mitchell Conference Center in Clayton, Georgia, as part of their orientation. “It’s just a great place for us to help our incoming students transition into the BBA Program and to begin to build the skills and competencies that are the hallmark of our leadership programming,” says Andrea Hershatter, senior associate dean for undergraduate education at Goizueta. However, this semester’s orientation was anything but routine, as students were able to witness a monumental event: the solar eclipse. Approximately 15 months ago, Hershatter and fellow event organizers realized that orientation would fall during the eclipse and Clayton would be in the path of totality. The team moved quickly to lock in the date. Additionally, the BBA Program was fortunate to secure physics lecturer Erin Bonning, director of the Emory Planetarium, to come and speak to the students during the event. Bonning outlined the ways in which humanity has observed and thought about this phenomenon since the time of Aristotle and how it helped to prove Einstein’s theory of relativity. She explained how orbits work and why solar eclipses where totality occurs over large land masses are so rare. In preparation for the event, Hershatter and her team ordered official NASA-approved eclipse glasses and printed NASA and Goizueta logo-themed bandanas. What started out as a crystal-clear day became worrisome at about 1:30 p.m., as clouds rolled in and threatened to obscure the view. However, the cloud cover held off just enough for the BBA class to enjoy all the phases of the eclipse, and the full two minutes and 30 seconds of totality. 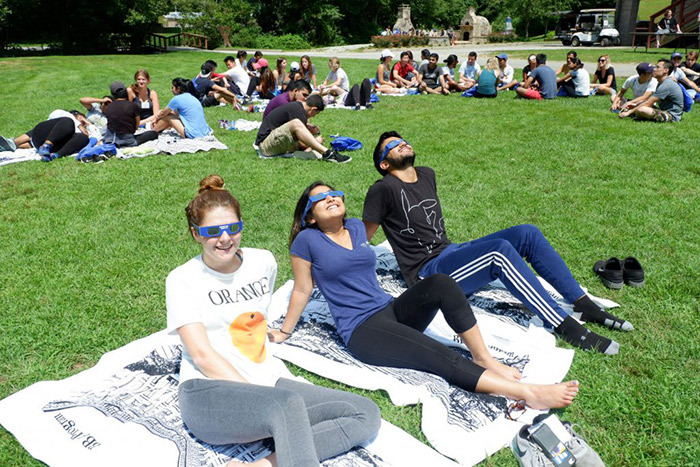 “We were amazingly lucky that the students could experience full totality,” Hershatter said, noting that just 90 seconds later would have obscured the event. Instead, at the moment of totality, the sky was still clear. The corona flared and students were able to remove their glasses and view the glow around the moon. College is transformational for most students, Hershatter said. However, it is usually measured in individual memories, rather than the collective one that will stand out for the BBA Class of 2019.